Part 1 The health benefits of functional dairy products: Dairy components in weight management: A broad perspective; The effects of dairy components on food intake and satiety; Dairy products, probiotics and the health of infants and children; Functional dairy products for gastrointestinal infections and dysfunction; Probiotics, prebiotics and inflammatory bowel disease; Dairy products and HIV/AIDS; Dairy products and oral health. Part 2 Functional dairy ingredients: Dairy propionibacteria as probiotics; Synbiotics: Combining the benefits of pre- and probiotics; Hypoallergenic hydrolysates for the prevention and treatment of cow’s milk allergy; Plant sterols and stanols as functional ingredients in dairy products. Part 3 Product development: Regulation of functional dairy products; Using biomarkers and other indicators of efficacy to demonstrate the health benefits of functional dairy products; Experimental models to investigate the effect of functional dairy products: The case of colon carcinogenesis; Molecular approaches to assess the activity and functionality of commensual and ingested bifidobacteria in the human intestinal tract; Genetics and functional genomics of probiotic bacteria: Translation to applications; Characterising probiotic microorganisms; Methods to improve the viability and stability of probiotics; Microencapsulation for delivery of probiotics and other ingredients in functional dairy products; Assessing the safety of probiotics with regard to antibiotic resistance; Development of dairy based functional foods enriched in conjugated linoleic acid with special reference to rumenic acid; Developing dairy weight management products; Developing a functional dairy product: From research on Lactobacillus helveticus to industrial application of Cardi 04 in novel antihypertensive drinking yoghurts. Dairy products have a prominent position in the development of functional foods. As understanding of the health benefits of dairy products increases and consumer awareness of these health benefits grows, demand for new and improved functional dairy products is likely to rise. Functional dairy products: Volume 2 reviews the latest developments in the field and their industrial applications. Part one outlines the health benefits of functional dairy products and their applications in areas such as weight management, child health and gut health. The second part of the book discusses various ingredients used in functional dairy products such as pro- and prebiotics, hypoallergenic hydrolysates and plant sterols and stanols. The final part of the book considers aspects of product development such as biomarkers and experimental models to investigate health benefits, genomics of probiotic microorganisms and functional dairy product regulation and safety. 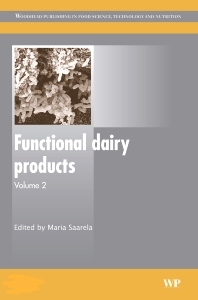 With its distinguished editor and collection of international authors, Functional dairy products: Volume 2, together with its companion volume, provides professionals and researchers within the field with an invaluable reference. Dr Maria Saarela holds a senior position at VTT, one of the world's leading centres for food research. She has published widely, particularly on aspects relating to probiotic dairy products.